We were delighted with the response to the only visit to County Durham of The Man Engine on Saturday 30 June: the largest mechanical puppet ever constructed in Britain. The Man Engine came to Willington and Willington gave him an amazing reception. Emily Diamand’s full report on the event is here. The Man Engine is giant animated puppet at a full height of 11.2 m in the form of a miner. The Man Engine crawls at 4m high & ‘transforms’ to stand at 11.2m high, powered by Volvo’s L220 wheeled-loader. The team behind the Man Engine, Golden Tree Productions, produced a bespoke visual, theatrical and aural experience for the Willington stop, highlighting the significance of mining industry in South West Durham. The Man Engine won the UK Best Arts Project in the National Lottery Awards 2017. 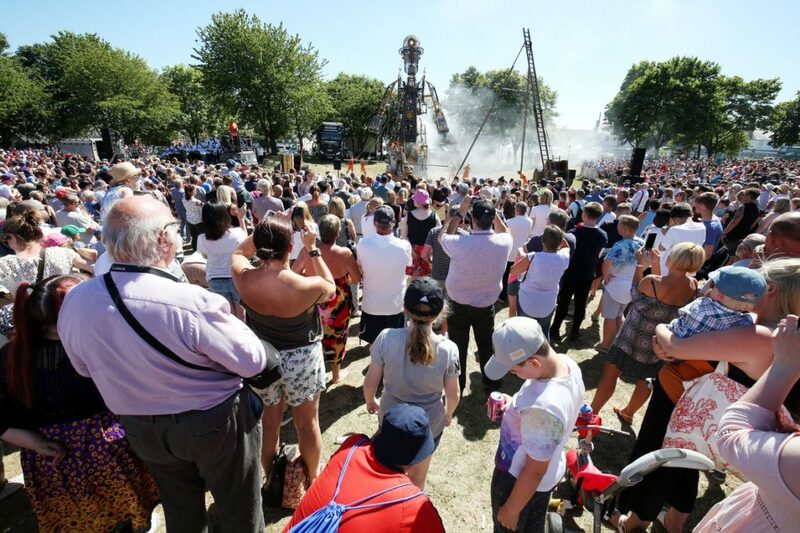 In 2018 it toured to former coalfield areas across the UK – and ended in Willington for the only appearance of the Man Engine in County Durham.